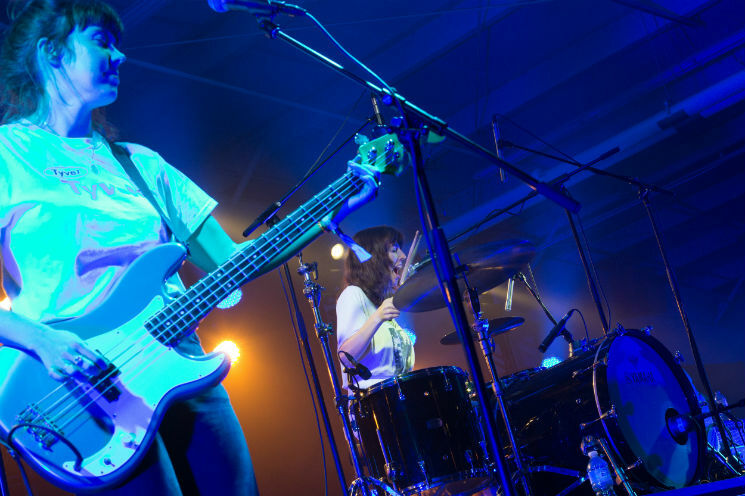 Thursday night's (October 19) HPX show by the Courtneys was the band's first, but not the first time its members have been to Halifax: bassist Sydney Koke, in fact, was trying to remember a particular beach she had been to. "I want to go to the beach later tonight and just look at the stars," she said from the Forum stage. "Is that weird?" Hardly — it had been easily the nicest day of the fall, after all. But first, Koke and her bandmates had to make their way through an engaging, inspired set of fuzzy, catchy rock songs for the early-evening crowd gathered at the Forum. Drummer Jen Payne does the singing, and bassist Sydney Koke takes on much of the banter duties, but it's the band's one actual Courtney — guitarist Courtney Garvin — who's perhaps the band's MVP. Open strings ringing, her guitar sound fills the mix with glorious fuzz, melodic and fulsome. It allows the band to extend songs like "Lost Boys" with long outros that can ride a single pattern, over and over, without growing the least bit tired. The melodies help, too. The Courtneys' songs are easily hummable aided by ample deployment of gang vocals that add force and heft. Songs like "Mars Attacks" from this year's II album and older songs like "Nu Sundae" were high-energy, spirited and loads of fun.